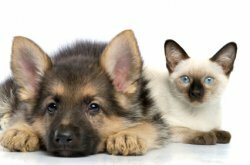 Do you have a possible pet emergency? READ NO FURTHER! CALL US RIGHT AWAY! Eagle Rock Emergency Pet Clinic is a full-service animal emergency clinic where we also offer emergency surgeries as well as urgent care and support. At our clinic we can provide crucial information regarding your pet's needs. If you have a question, please call us at 323-254-7382 or email us and we'll promptly get back to you. (PLEASE do not send an email if you believe your pet might be having an emergency. Call us right away.) Our veterinary office is located in the heart of Eagle Rock, and we have provided directions on our Contact Us page. At Eagle Rock Emergency Pet Clinic, we treat your pets like the valued family members they are. "My co-worker's dog bit my dog's face tonight and blood was pouring all over my hand as I carried my dog. It was so scary. Luckily this place is about a 5 minute drive from where I live." "My first visit was several years ago when one of our smaller dogs got attacked by a bigger dog. We ran into the clinic and the waiting room was packed, but because of the seriousness of the injury, they triaged us in right away which I really appreciated." "She was fantastic, walking us through all the options, doing 2 sets of blood work (no charge) b/c she couldn't believe the results."